Hajime Sato is one of my favorite directors and one of Japan's most talented eccentrics. Though he's lensed only a handful of films, each bear his lively and visually inventive mark. Among these are a the Bavaesque haunted house horror, 'Ghost of the Hunchback' (1964); the underwater adventure, 'Terror Beneath the Sea' and the superheroic 'Golden Bat' (both from 1966 and both starring a young Sonny Chiba). 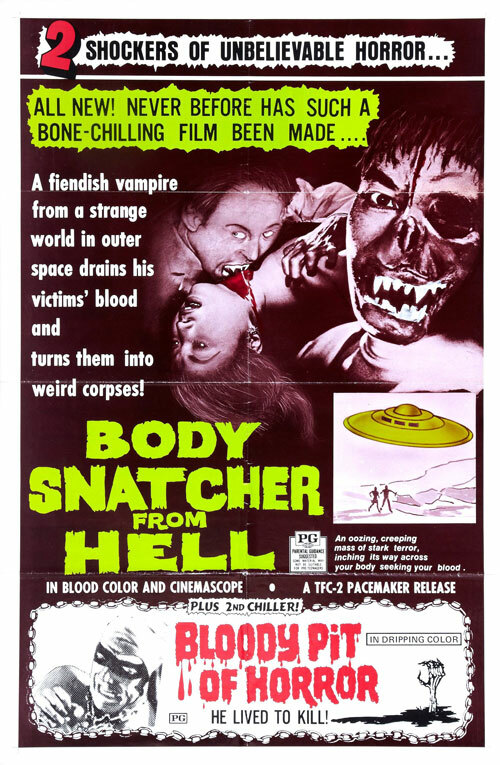 In 1968, Sato unleashed his masterpiece, 'Goke - Body Snatcher From Hell', one of the gaudiest, most bizarre and frightening sci fi/horror pictures of the '60s'. The opening scene depicts an airliner flying through an ominous red sky (Quentin Tarantino payed homage to this sequence in 'Kill Bill'); "Like flying through a sea of blood" remarks the pilot. Things grow grim in a hurry as birds mysteriously off themselves by splattering onto the windows for all the passengers to see (never a good sign). Forced to make a crash landing in the middle of nowhere, our illustrious passengers soon find themselves at odds with each other. The only two 'decent' human beings on board are the pilot and stewardess. The rest of this group are a microcosm of the worst that civilization has to offer, including a slimey politician who offers his wife for service, a creepy psychiatrist, a young terrorist wannabe, a near crazed American widow who's husband had just died in Vietnam (leading to the first of several 'Nam sequences) and worst of all, a sickly looking political assassin. The latter promptly holds the stewardess at gunpoint and flees the plane with his hapless hostage. Stumbling around the rocky terrain, our 'couple' happen upon a glowing flying saucer. It's light puts the assassin in a trance and telepathically splits his noggin open fron nose to forehead (a pretty disturbing effect). Out from the ship comes it's passenger, a parasitic shaving cream like substance that enters the open wound and takes over it's host. Our newly 'possesssed' Earthling proceeds to go after the rest of the passengers, vampirically sucking their blood from their necks. As it turns out, our unfriendly visitor is only the scout for a planned takeover of Earth as it deemed us the most warlike race and thusly, the best served for a massive takeover. An apocalyptic freakout masterpiece, Sato fills every frame of 'Goke' with garish colors, creepy imagery, a pervading feeling of dread throughout and populates it with unsavory characters that offer no relief whatsoever. The effects work though crude, are very effective with the aforementioned head splitting moment being an image you will not soon forget. The actors give it their all with closeups of sweaty, buldgy eyed, panic stricken mugs being the norm here. The final effect is of a movie that is one hiccup away from being placed in a cinematic straight jacket. Having first stumbled upon this one time rare video release at a local Mart some 15 odd years ago, it is finally (and justifyably) getting the Criterion dvd treament in a four film set along with lesser, but still worthy entries; 'Genocide - War of the Insects', 'The Living Skeleton' and 'The X From Outer Space'; loopy freakouts all.